It is traditional for universities to recognize alums who travel farthest to attend annual fall gatherings known as homecoming. It will not be difficult to determine who that person is next week at Sam Houston State University. The university will confer its fourth Sam Houston Humanitarian Award on Thaksin Shinawatra, prime minister of Thailand, in a ceremony scheduled for 2 p.m. Wednesday in the Beto Criminal Justice Center Killinger Auditorium. Homecoming events also include presentation of additional awards, receptions and other gatherings, a Saturday morning parade, and a Saturday afternoon football game. 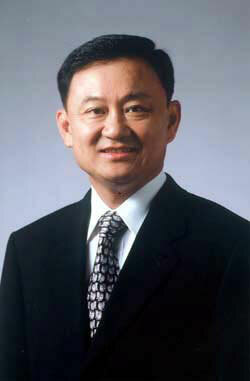 Thaksin became affiliated with Sam Houston State University when he came to study for his doctorate in criminal justice, which he received in 1979. The SHSU program is highly ranked and its faculty are often sought as experts on such topics as the recent Washington area sniper situation. His professional career began as a policeman. He graduated first in the Thai Police Academy in 1973, and after earning two degrees in the United States returned to serve in police positions in Thailand until 1987. In addition to attaining the highest credential in the criminal justice profession, he credits his studies at Sam Houston State for whetting his appreciation for computers and information technology. In 1982 he and his wife, Potjaman, established their first computer-related business venture. After he left police service, their Shinawatra Computer and Communications Group began its rapid growth. Starting with leasing computers to government agencies, the company expanded into computer sales, SOS signaling equipment, radio entertainment in buses, paging, cellular telephone operations and sales, and cable and satellite TV. In 1992 he was named the "1992 ASEAN Businessman of the Year" and has since received many other awards acknowledging his and his family's business achievements. An indication of his success, as well as his political philosophy, is his project to establish an entirely new, technology-driven university just outside Bangkok. At Shinawatra University students use portable computers the way more traditional students use notebooks. The language of instruction is English, to ensure that graduates are well equipped to join the global workforce. The Shinawatra family has spent an estimated $150 - $200 million for the land, its development, buildings and associated facilities, equipment, and personnel. Since he began his interest in applying computer-related and technology solutions to police problems, Thaksin has also promoted such uses for educational development in his country. In 1993 he established the THIACOM Foundation to provide satellite education programs for young children in remote areas of the country--children who would otherwise be unable to continue their education. Thaksin has said in interviews prior to and since his election that he is a great supporter of political reform and empowerment for his people. In one interview, he stressed his support for the country's new constitution because of the effect it will have on politics and his country's economic development. "It proposes public scrutiny, full accountability," he said. "Most importantly, it creates a political system that emphasizes the development of quality of life for the people first and foremost." Since Feb. 9, 2001, when he became the 23rd Prime Minister of Thailand, a country of 62 million people, he has been working toward that goal. He previously served in government positions as minister of foreign affairs and deputy prime minister. Throughout the years he has maintained his ties with Sam Houston State University. In 1996 he received the Outstanding Criminal Justice Alumnus Award and Distinguished Alumni Award from Sam Houston State University. Previous recipients have included James A. Baker, III in 1993, Lech Walesa in 1996 and former President George H. W. Bush in 1998.